Summer has lingered around here. But the calendar has turned the page, and it's October. . . and I'm ready to decorate my house in accordance with the calendar instead of the weather. Cooler days are coming, I know! Here's how you'd be greeted if came to my home today. There was a time when I wanted more, more, more fall decorations at the front door, but these days I'm happy with just a few. 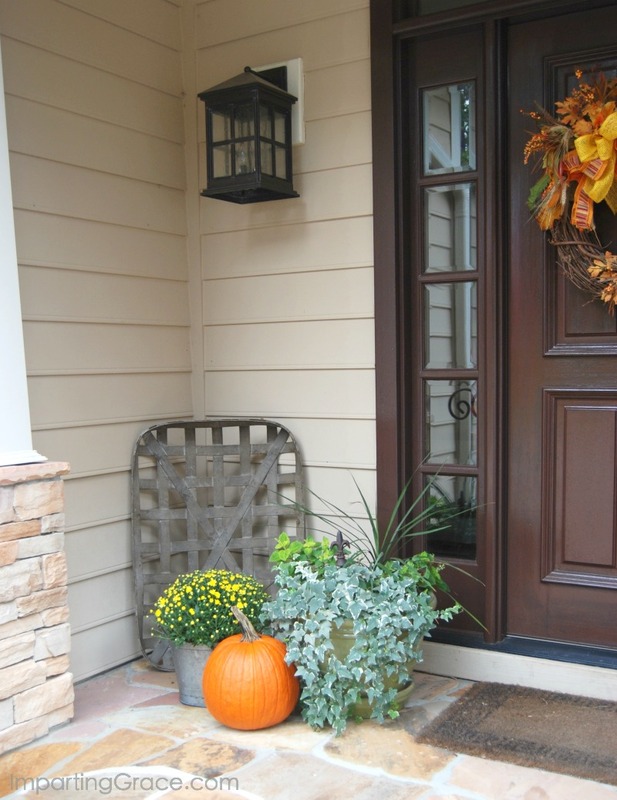 I filled my lanterns with gourds, hung a wreath on the door, then added a couple of pumpkins and a couple of baskets. 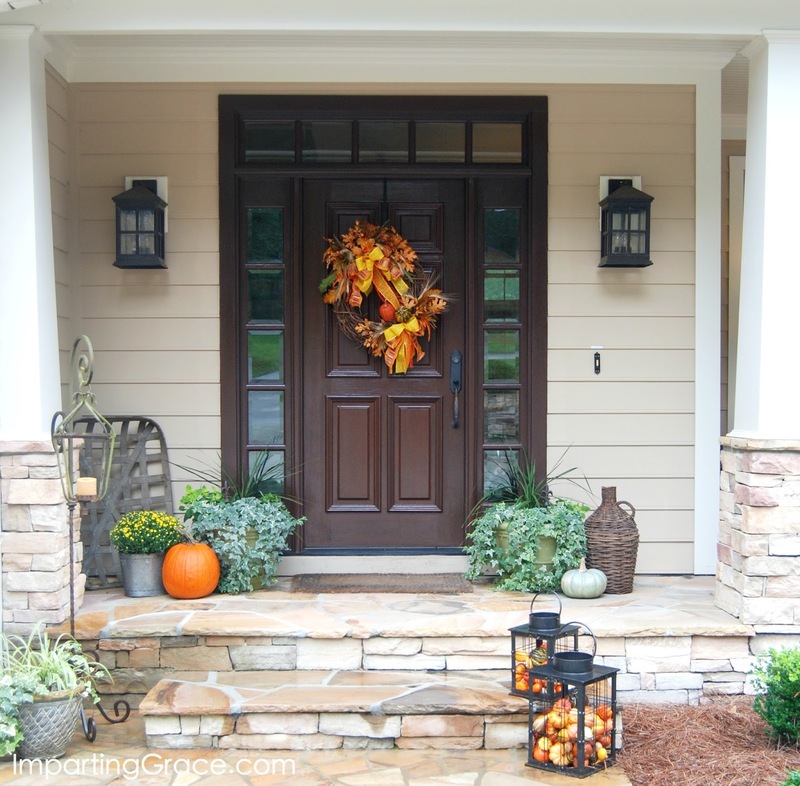 One mum adds some fall color and I hope the doorway says "Welcome friends" as well as "Welcome Fall"! One of my favorite finds this year is a tobacco basket. While I'm not a user of tobacco products myself, I live in Durham, North Carolina, and tobacco is a big part of our local history. To the right of the front door is my favorite spot in our house--our outdoor living room. This area of the porch is surrounded by house on three sides, open only to the North on the front of the house. It's such a protected nook that we use it in most seasons, but Fall is our favorite. I had new covers made for the outdoor furniture this year (click here for a helpful post on choosing outdoor fabric). I'm enjoying the fact that the furniture is now so neutral that I can do whatever I want with throw pillows. I've had this pillow fabric for years, and it seemed just right for Fall, so I used this simple sewing technique and stitched up new pillow covers in no time. Other than changing the pillows, I simply added a couple of little pumpkins and a Fall message on the chalkboard. 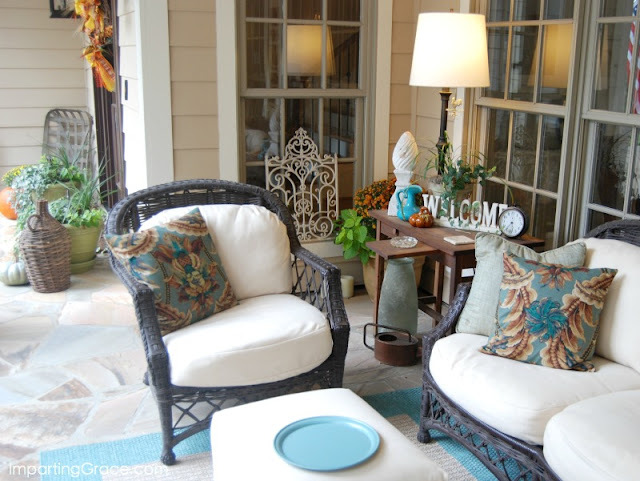 These simple changes took just a little bit of time, but I think they make the porch look welcoming for the season. Now if you could just come sit here with me and have a cup of mulled cider! Wouldn't that be a good way to celebrate the coming of Autumn? Love the lanterns with gourds! Your front page looks soooo fallish...and inviting! 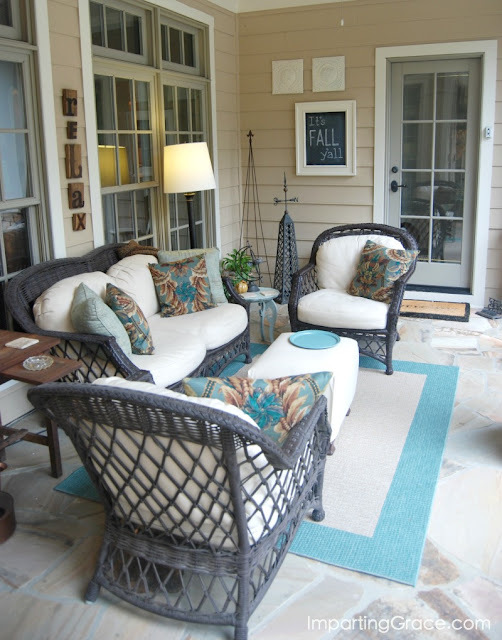 Oh I love your fall decor and I love, love, love your porch living room. That is so pretty and the aqua fabric is wonderful. I would love to sit there. 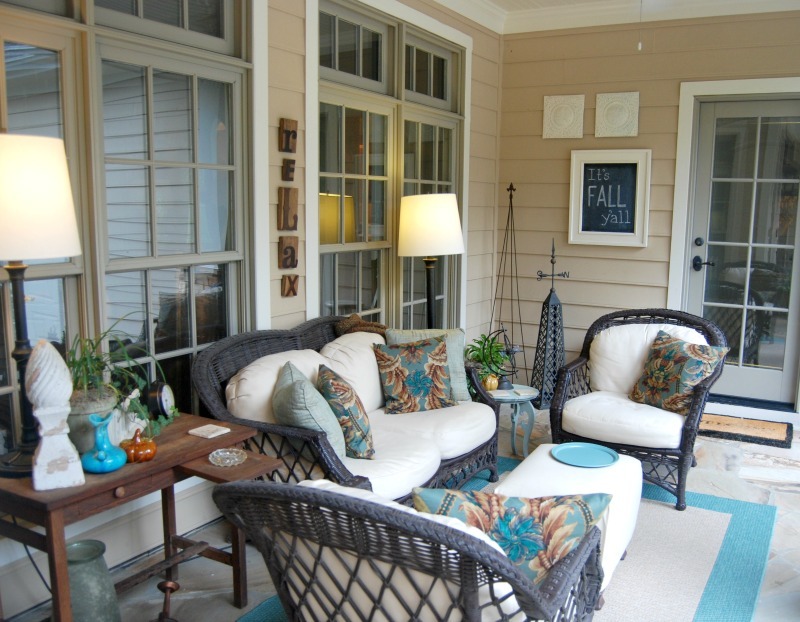 Your porch is so cozy and welcoming! I love the lanterns filled with gourds. Great idea! Your front porch is always a favorite of mine. Absolutely beautiful! I love the RELAX letters on your patio. I bet that's the perfect place to have a cup of coffee and start your day with a devotion each morning. I think I could live out there! So beautiful and I love all your fall decor! Beautiful! Love the pumpkins in the lanterns. Your guests receive a warm welcome. Thanks for sharing! 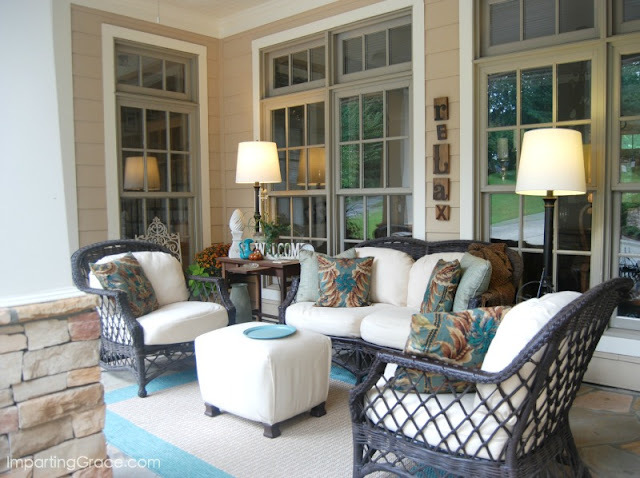 I always enjoy seeing your front porch, because it looks so inviting! I really like the new pillow cover fabric. I would love to join you for a cup of warm mulled cider, Richella.